These days, Telemundo has published a wonderful interview with IL VOLO, made this summer, for the television program Don Francisco. When I saw it, I laughed a lot, the boys were simply adorable and nice. The interview is in Spanish. I do not know this language, but being similar to Italian, I understand everything that is said, so I will make a rough translation of what is said. The first video is a complete collage, the following videos are fragments of the piece I’m translating. Let’s start with a trio of young Italians. They already hold 10 years of international success and are: GIANLUCA, IGNAZIO and PIERO, a loud applause, IL VOLO. DF = By the way, you are doing 10 years of business and are promoting new material. G = Everything started in 2009, next year will be 10 years. DF = Next year, we met seven years ago. G = (pointing to Ignatius) He was fatter. DF = A nice difference 35 kg less. G = These guys are spiteful, maybe because they are Sicilian. DF = And you are not? G = Not me, I live near Rome. I = (to Gianluca) Hey Roman, be careful how you speak. DF = You Piero studies lyrical singing. P = YES, I study every day, because my passion is the opera and my dream is to be able to sing one day at La Scala in Milan or at the Metropolitan in New York, a whole opera. I = And have us in the first row. P = Always, even my motorcycle was called Pavarotti. But I have the same voice as my grandfather, identical. DF = You are promoting a new record, which will be published when? G = For now we publish a single, because it differs a little from our usual genre, turns to Latin music, is a tribute to Latin music, we made this record with Emilio Estefan, who is the producer of this album. DF = You will sing this Spanish record with Estefan. I = No, Emilio Estefan is the producer. DF = Of course, Emilio does not sing anything, that sings is his wife. G = Yes, of course, she is Gloria. DF = And are you happy with the work and the result? 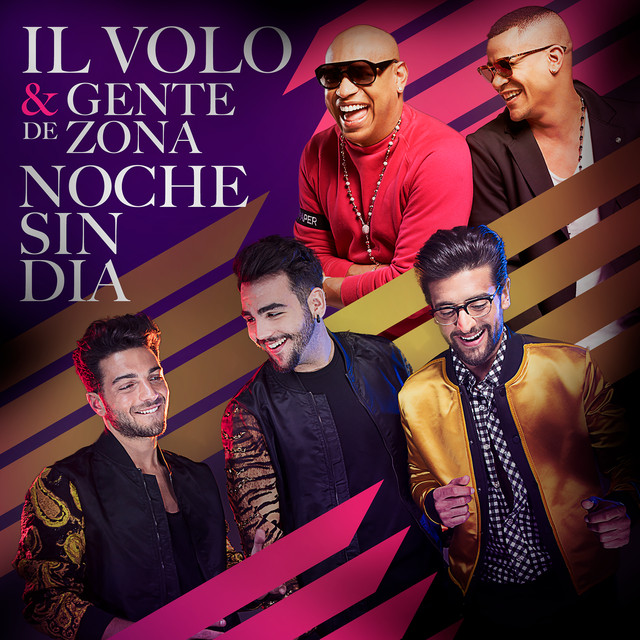 G = Yes, we are young and we wanted to do something different, the duet is with Gente De Zona, IL VOLO and GENTE DE ZONA. DF = (asks Ignazio) do you have problems with the microphone? DF = And now it’s time to play !! At this point a nice game begins that involves the boys and the public. The public will have to answer some questions about the boys and if they guess, they will have a cash prize. DF = Our Jessica receives a kiss from Piero, Ignazio and Gianluca because she has to go. I explain the game, we will ask questions about Gianluca Piero and Ignazio, we will ask one person the answer, another person can give a different answer, which of the two will have guessed, will win money (500 dollars?). The person who has won will also be able to answer the next question. Do you agree? Let’s start with you, stand up, what’s your name? Salia. Well Salia, the first question for $500 dollars. Which one of them worked on the ears to make them smaller: was he Gianluca, was Ignazio or was he Piero? Gianluca, Ignazio and Piero, who of you was operated on the ears? DF = Meanwhile, I give the money, explain why you did the operation to the ears? I = (addressed to Salia) but Don Francisco explained to you that you owe us 10% to us? DF = And why not, look, I’m giving her $500 money. So why did you operate your ears? P = At the age of five I kept them like that (he opens his hands like Dumbo) and riding a motorbike, the wind attacked them. DF = A applause to Piero. P = Bella, keep the money that we then go to dinner. DF = Second question, which of them three to five years gave their first kiss, under a sofa? (Salia answers Ignazio, another woman answers Gianluca). Who was three? I = It was me. DF = Ignazio, but really at 5 years? I = Yes, I had 5 but it was a very tall sofa, otherwise I did not pass under it. DF = Under the sofa, and how old was the girl. DF = Another 500 dollars to Salia. Third question: which one of them has the shortest foot? Look at the feet, which of them three has shorter feet? (Salia answers Gianluca), what do you say, will he? P = What a fool. P = You did not give the second option !! DF = What Italian shoe size do you wear? DF = And you Ignazio? DF = And you Piero? P = I lost my bill. DF = What number do you wear? DF = Salia wins 1500 dollars !! Fourth question: which of them burned his father’s car, when he was 4 years old, and sent her against a wall? I = It was me! DF = Two hundred dollars for you (the woman who said Ignazio) and now who wants to answer for the last question? Jennifer, here’s the last question for $ 300. P = It was me. DF = Well, $ 200 for you (to the man, and then to Piero), now you have to tell me quickly how the experience was. DF = A big applause, for the sympathy to Gianluca, Ignazio and Piero. Change scene, Don Francisco is interviewing a young singer and IL VOLO. DF = I wanted to ask you something, why do not you do a tribute to a singer, would you do it? G = It all started when we were 14, we thought we were singing and we met in this contest, the first time we sang together was April 25th 2009, and we sang O SOLE MIO, the strength of the three of us was incredible because you imagine three children singing with the voice of adults. DF = And who won the competition? DF = You won the competition. And now what are you going to sing? P = Now let’s sing NOCHE SIN DIA, which is our last single. Produced by Emilio Estefan, we will sing alone here, but in the first version we sang it with Gente de Zona. 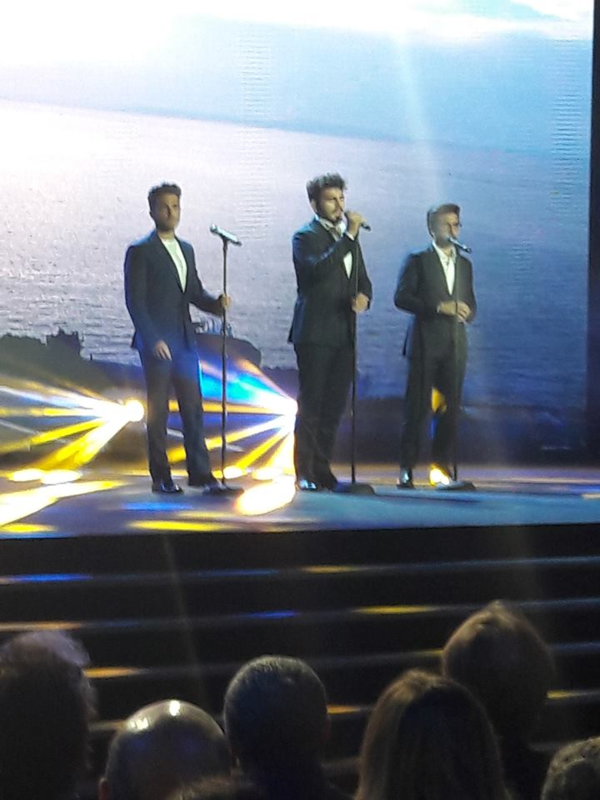 DF = A big applause for IL VOLO: Noche Sin Dia. DF = Here is our next guest Stephania Duque. I was talking here with this singer and IL VOLO. DF = Do you like Stephania? But she has a husband. I = Like how, do you have a husband? Flautist, ……. I did not want to betray you. P = Stephania, ask if I can sing a song to your ear. DF = Now IL VOLO must fly to Rome, Italy, because tomorrow they will have a concert. P = yes tomorrow we’ll have a concert and now we’ll say hello (they sing O Sole Mio). DF = I hope you enjoyed this program. I = We like you a lot, because you have always been good to us, we love you, it is a pleasure for us to be here, greet you and tell you, that when we want we come here, for you, because you are the best of all. DF = I do not believe, even if I like it very much, to be the best of all. I = For us yes. G = Yes, of course. DF = I greet IL VOLO, a big applause, you are always welcome. G = See you in Italy. DF = Thank you all. And here’s a short video taken during the shooting of the show. I had a lot of fun watching these videos, first of all because the guys were amazing, they had fun and they enjoyed the audience. Their singing performances were perfect as usual, they were polite but also a little easygoing without overdoing too much. I saw them pleasantly relaxed, at ease, which is difficult when they are interviewed in Italy, because here every moment is controlled, for fear of the inevitable criticism of the day after. Ignazio was very strong, funny and disrespectful, but with sympathy, also good Gianluca and Piero who were able to get involved with even a little embarrassing questions. I hope the translation has served you and I hope you enjoyed it as much as I did.